Humanity has used animal hides since the Paleolithic, for clothing as well as mobile shelters such as tipis and wigwams, and household items. Since ancient times, hides have also been used as a writing medium, in the form of parchment. Fur clothing was used by other hominids, at least the Neanderthals. Rawhide is a simple hide product, that turns stiff. It was formerly used for binding pieces of wood together. Today it is mostly found in drum skins. Tanning of hides to manufacture leather was invented during the Paleolithic. Parchment for use in writing was introduced during the Bronze Age and later refined into vellum, before paper became commonplace. 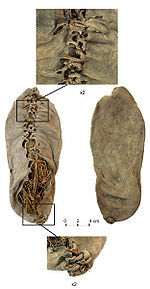 The world's oldest leather shoe. 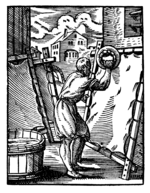 A German parchmenter during the 16th century. Ian Gilligan (Australian National University) has argued convincingly that hominids without fur would have needed leather clothing to survive outside the tropics in mid-latitude Eurasia, southern Africa, and the Levant during the cold glacial and stadial periods of the Ice Age, and there is archaeological evidence for the use of hide and leather in the Paleolithic. Simple, unmodified stone flakes could have been used to scrape hides for tanning, but scraper tools are more specialized for tasks such as woodworking and hideworking. :19-20, 37 Both of these stone tool shapes were invented in the Oldowan,:61, 66-67, but direct evidence for hideworking has not been found from earlier than about 400,000 years ago. Examination of microscopic use-wear on scrapers demonstrates they were used to prepare hides at that time at Hoxne in England. The first written references to leather are documented from Ancient Egypt around 1,300 BCE. Various substances used were tannin obtained from trees, as well as animal brains, or faeces. The odor from tanning separated the tanneries from populated areas. During the Middle Ages, leather craft was developed, as turnshoes and welt shoes were invented. Refined kinds of leather such as suede and nubuck were also introduced. New kinds of tanning chemicals came to use during the Industrial Revolution. Chromium tanning was invented during the 1850s. Patent leather has been manufactured since 1819. Phenol formaldehyde resin came into use during World War II. Fur farming was introduced in the 19th century, and is today the main source of fur clothing. Synthetic fur is an alternative to genuine fur, for cost and ethical reasons. Several kinds of synthetic leather have been invented during the 20th century. ^ a b c Scarre, Chris, ed. (2005). The Human Past. London: Thames and Hudson Ltd. ISBN 978-0-500-28531-2. ^ Keeley, L. H. (1980). Experimental determination of stone tool uses: A microwear analysis. Chicago: University of Chicago Press. p. 128-151. ISBN 0-226-42889-3. ^ Henshilwoood, C. S.; d'Errico, F.; Marean, C. W.; Milo, R. G.; Yates, R. (2001). "An early bone tool industry from the Middle Stone Age at Blombos Cave, South Africa: Implications for the origins of modern human behaviour, symbolism and language". Journal of Human Evolution. 41 (6): 662. doi:10.1006/jhev.2001.0515. ^ ""السومرية"... أقدم حضارات العالم". عرب 48 (in Arabic). July 12, 2016. Retrieved 20 June 2018. ^ "The History of Leather". Vonbaer.co.uk. Retrieved 2018-05-24. Scarre, Chris, ed. (2005). The Human Past. London: Thames and Hudson Ltd. ISBN 978-0-500-28531-2.